Her partner confuses her; she's never known a boy like him before, as prone to touching her gently as to using his knives with feral grace. As Deuce's perception shifts, so does the balance in the constant battle for survival. The mindless Freaks, once considered a threat only due to their sheer numbers, show signs of cunning and strategy... but the elders refuse to heed any warnings. Despite imminent disaster, the enclave puts their faith in strictures and sacrifice instead. No matter how she tries, Deuce cannot stem the dark tide that carries her far from the only world she's ever known. My Thoughts: Wow, I really enjoyed this one! Enclave reminded me a bit of The Hunger Games, yes it was very awesome! We meet Deuce who is a huntress. She has earned this title over years of being strong and able to hold her own. We also meet a few of her friends. Than we meet Fade. Fade gets paired up with Deuce and they are to become partners. They find food for everyone else. Deuce has grown up underground while Fade lived topside for the first years of his life. These two fighters grew up listening to the elders about what the outside world is like. They have Hunters, Breeders, and Builders.Some believe she should be a breeder but she is determined to prove to everyone, she belongs as a huntress. Deuce and Fade are weary of each other at first. They find it hard to trust other people, especially people they aren't really all that familiar with. They go on a journey and bring back a young boy who speaks of the outside. Nobody really believes him. One of Deuce's friends get blamed for a crime he did not commit, and Deuce speaks up and says she did it (even though she didn't) and she gets banished from the enclave. Of course Fade doesn't let her go alone. They set out to an unknown world where they meet friends, enemies, people die, people live, people despise, people love. I thought Stalker was a pretty good addiction to their team. At least once he got over being in "charge." I also liked how close Deuce and Fade became. I was rooting for them to become a couple the whole book! 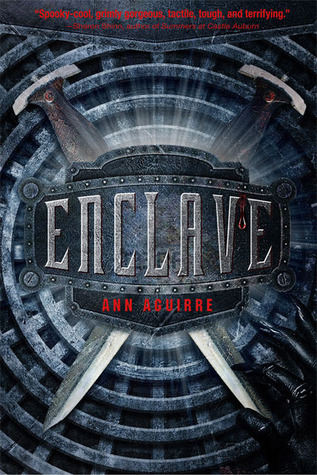 I loved Enclave. I won't say much else or else I'll ruin the book. Enclave reminded me a bit of The Hunger Games and I loved The Hunger Games. After reading Enclave, I wanted to rush right out and try to find other books similar to this. Overall: Loved it! Can't wait to read the next book! It can't come out soon enough! Cover: Its different but I like it. I've seen a few different versions of this cover. I won this book recently, a beautiful hardcover! Can't wait to read it, everyone says it's great! I LOVE YOUR REVIEWS!!!!! they always tell me exactly what i need to know about the book and whether i'm going to like it or not! thank you!